Flexibility. If you are using your bearing heater in a maintenance shop, chances are you may have various sized bearings that need to be heated for installation. Make sure you choose a bearing heater that can accomodate multiple bearing sizes. Cone Mounter Bearing Heaters are available in small, light-duty sizes to large, heavy-duty sizes. Find a bearing heater that best fits your size requirements. Portability. Many bearing induction heaters are heavy and not easily transportable, so the bearings must be taken to the area of the shop where the bearing induction heater resides. This can be inconvenient if you're trying to get several things done at once. Cone Mounter Bearing Heaters are lightweight and can be easily moved to the area of the shop where you're working. Magnetization. Induction heaters surge electrical current through a bearing to heat it up, which can often magnetize the bearing and result in a shorter service life. 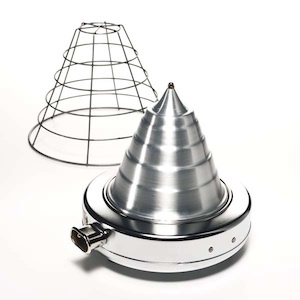 Cone Mounter Bearing Heaters feature a unique cone-shaped design that heats the inner race of the bearing without any electrical current, guaranteeing your bearings will not be magnetized during the heating process. Thermostat. When you're busy multi-tasking in a busy shop, the last thing you have time for is to sit and watch your bearings heat up. Some Cone Mounter Bearing Heaters offer a convenient thermostat that ensures that the bearings will reach the desired temperature and maintain that temperature until you are ready to install the bearing. This is a bearing heater feature that will make huge gains in your productivity. Reliability. Heating bearings should be a routine task that doesn't offer headaches or hassles. That's why you need a bearing heater that will do the job day-in and day-out without problems or malfunctions. Cone Mounter Bearing Heaters are made of quality components and assembled in the USA by skilled workers who take pride in every unit they build. Cone Mounter Bearing Heaters offer a full one-year warranty against manufacturer's defects. Affordability. Induction heaters can set you back upwards of $1,000 or more and are definitely not the best value on the market. Cone Mounter Bearing Heaters are extremely affordable, whether you're outfitting a small shop or a large production facility. Ease of Use. It shouldn't take a rocket scientist to heat up a bearing, but some bearing heaters require a fair amount of training and practice to heat a bearing to proper temperature. Cone Mounter Bearing Heaters are easy to use and produce a consistent result every time, meaning anybody at the shop can handle this duty.